With six wins in six games thus far at the 2019 IIHF Women’s World Championship in Espoo, Finland, the U.S. Women’s National Team has become so dangerous as a team because of that simple fact: it’s a team. And it’s not powered by just offense, stifling defense or shutdown goaltending. It excels at all facets of the game. Its success is well-documented, from the 2018 Olympic gold in PyeongChang to winning four straight World Championships, and it has its sights set on a fifth straight gold this weekend. Holding a 6-0-0-0 record as they enter the final game, the U.S. have scored a tournament-leading 6.5 goals per game while allowing just 0.66 goals per game, also tops in the field. The blue line has been especially imposing through the preliminary and quarterfinal rounds, both offensively, combining for 29 points, as well as defensively. Alex Rigsby has earned four wins in four starts, including two shutouts, and Maddie Rooney chipped in with a pair of shutouts of her own as the U.S. hasn’t allowed a goal in four straight games due in large part to stout defensive showings. The rearguards are experienced, with all seven defenders possessing Olympic playing experience. The most veteran player of the unit is three-time Olympian Kacey Bellamy, and the youngest are 2018 Olympic champions Barnes, 20, and Megan Keller, 22, who played together at Boston College this year. The pair of Eagles, Barnes of Eastvale, Calif., and Keller of Farmington Hills, Mich., have contributed quality offensive showings throughout the tournament. Through six games, each player has two goals and four assists while sporting a plus-9. 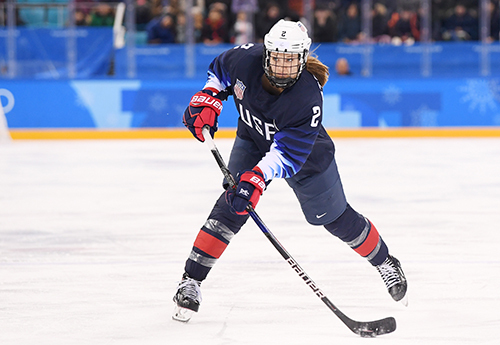 2014 Olympian Megan Bozek is among the list of defenders with multiple goals for the U.S. with two, while two-time Olympian Lee Stecklein also has a pair. More regarded for her defensive prowess than being an offensive catalyst, Stecklein scored twice in the preliminary-round win over Russia, notching her first goal in IIHF competition in her 43rd start. Stecklein scored her first IIHF competition goal this past week and then added another in the same game. Every defenseman on the team has contributed offensively and gotten on the scoresheet so far in the tournament. In his first year as the head coach of the U.S. Women’s National Team, Bob Corkum has implemented a system that has enabled the defenders to jump up in the rush and utilize their speed and skating, promoting timely pinches. It’s been a different path to best-on-best international competition this year for Barnes and Keller. Last year, the USWNT congregated in Tampa, Fla., for much of the year to train. Both players were redshirted at Boston College as they chased and fulfilled their Olympic gold-medal dreams. For those two, being back on campus between stints at the Four Nations Cup in early November and Worlds here in April renewed the feeling of how special it is to represent your country. This year the duo played a lot together as a pairing and it has showed in their growth and familiarity. 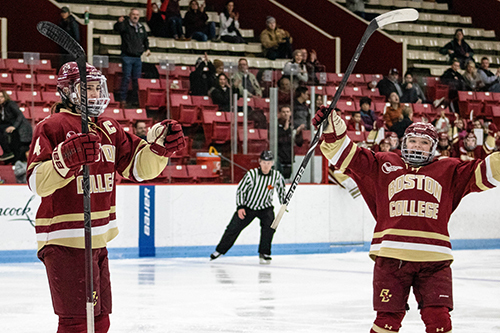 Cultivated at the Olympics and at Boston College, Keller and Barnes have formed a dynamic pairing that should drive play from the backend for the U.S. for years to come. Between the two, the respect and admiration is mutual. For as close as these two have become over the past year, Team USA is anchored by a strong veteran core as well. “Our veteran group has showed us what it means to compete for your country and what it means to compete your hardest and do everything in your power to work for one another,” Keller said. That veteran batch is led by captain Kendall Coyne Schofield, who has eight points, and Hilary Knight, who leads the tournament in goals (7) and points (11). After appearing in the semifinal against Russia, Knight's 51st career game in the Women’s World Championship, she surpassed Jenny Potter and Angela Ruggiero for most all-time for an American player. The defenders will certainly play a big role in whether or not the U.S. will take home a gold medal or not, with the ultimate contest being played on Sunday at 1pm E.T. 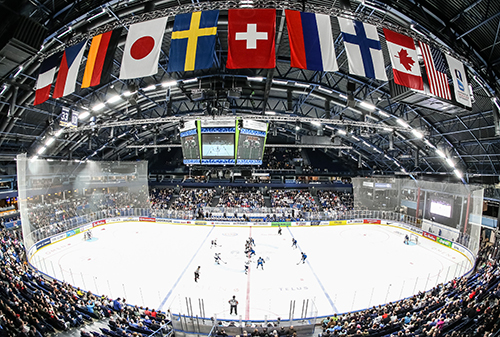 against host Finland.